Control: Access your BIM content anywhere, anytime and with anyone from a single source — across offices and locations. Drive data consistency for proprietary, generic and manufacturer content for the entire team across the entire project with automatic versioning updates. Manage: Locate, leverage and utilize vetted building content quickly and efficiently via smart content libraries, saved searches, advanced filters, automatic meta tagging, reporting and much more. Add as many users as needed to share content libraries internally and with outside consultants. Analyze: Ensure model integrity, content accuracy and compliance across local and global standards while gaining unique insights into how and when content is used with powerful reporting tools. Family Category Report – View each family category based upon the amount of content per category. Nested Family Report – See how many nested families exist and how many levels deep of nesting are present. Imported CAD Geometry – Identify which families include CAD-based geometries and prevent Revit from crashing. Shared Parameter Report – View all Shared Parameters in use across your entire content catalog – learn what matches your company’s SP file and what doesn’t. Parameter Formula Report – Visualize parameter formulas and quickly identify complicated ones that can slow down projects. Quality Content: All content on UNIFI Connect has gone through a rigorous quality control process to ensure it meets the highest standards and can be “whitelisted” into your libraries. Content Control: Easier to integrate manufacturer libraries into firm-based libraries via the UNIFI portal. Versioning of BPM content so you can track every change. Enhanced Communication: Connect directly with manufacturers to share feedback on the quality of content, availability of specific content, content requests. Connect directly with UNIFI to request specific manufacturer content for the portal. Leverage our expert UNIFI Create the team to rapidly build unique components according to your organization’s standards – we’ve built thousands of components for hundreds of organizations. Depend on UNIFI’s team to create your unique library of high-quality components, and allow your team to focus efforts on what they do best – designing, building and operating buildings. Unifi is the perfect tool to share families between differents offices of a company. The interface is clear and the validation workflow simple and efficient. The capability to utilize the cloud to efficiently load content directly into our documentation software is paramount to our firms workflow. Well done UNIFI Labs! Unifi is an excellent Revit content manager. The ability to also manage system families and drafting views is like a bonus. The Unifi crew are very responsive and are always looking for ways to improve the product. Unifi slotted seamlessly into our workflow. Library management is simple; analytics allow us to track content use and fix issues quickly. Our staff love it. 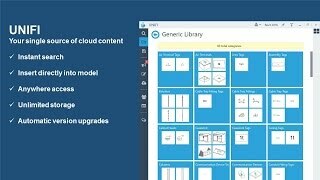 Easy to set up and deploy, this tool gives me the ability to better control the quality of my BIM models and at the same time provides a path to create new content and edit existing content. It makes it easier and quicker for users to find what they are looking for and be assured that they are using approved content. Thanks Unify! The ability to customize your library and the data in it is amazing. Let's users upload content to be approved for capturing work that others have done. System families can be uploaded which is fantastic. Our plumbing firm has adopted Unifi as our content solution. We travel often, and Unifi allows us access to our content anywhere in an environment that is user friendly, and productive. We are now hosting all of our groups, and to have a solution that allows us to work faster and more efficiently is just simply icing on the cake! 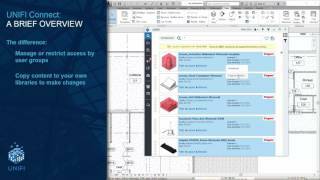 Unifi is easy to use, powerful, continuously improved, and great for BIM users and managers alike. Content Management at its best! Not only is this a great content library manager, it is shaping up to be a fantastic BIM analytics engine. There are no real competitors in this space. It's fast. It's generally fun to use. I find this to be the best way to manage Revit content, period.